European Union Election Observation Mission say di Nigeria March 23 supplementary govnorship election get problems wit security and vote buying. 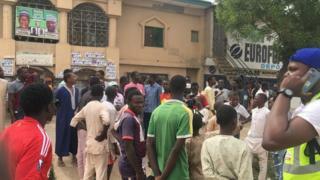 Di EU Observer Mission say dem bin send 20 of dia pipo go Bauchi, Benue, Kano, Plateau and Sokoto, di five states wia elections bin happun, to see how Nigerians take cast dia votes, plus how di Independent Natinal Electoral Commission bin take gada di results. Dem say security bad for some areas wia some jaguda pipo cari weapon take dey intimidate voters and security pipo no properly protect kontri pipo. According to dem, e get some areas for Kano state wey dem no allow any observer plus journalists to enta. Anoda tin wey dem bin notice be say, party agents bin chook hand for wetin no concern dem and party leaders no try to control dia supporters. Dem say even though dem note for polling units wey dem fit observe say di arrangement to move election materials make more sense dis time and dem follow most of di procedures, problem bin dey as secret no too dey for di ballot system. Throughout di day, di EU observer mission say INEC no tok pim ontop all di katakata despite say di election and security arrangement na dia overall responsibility.